We established the Bangi Field Station (hereafter Bangi FS) on the 4th floor of the Institute of Malay World and Civilization (ATMA) of Universiti Kebangsaan Malaysia(UKM). Bangi FS is being used as a base for on-site research and education in Malaysia and Singapore for ASAFAS and CSEAS students and faculty members and as a place for scholarly exchange between UKM and ASAFAS, CSEAS. The Field Station is equipped with a work table, coffee table, book case, computers (1 desktop and 1 notebook), printer, and scanner. Bangi FS provides research support for ASAFAS graduate students as one of the pillars of its activities. In this fiscal year three graduate students were engaged in on-site research and literature research with Bangi FS as their base. One of them is receiving funding from the 21st Century COE Program. Each of the students received advice on applying for a research permit, searching for reference materials, and on-site research from faculty members of ATMA and UKM and other institutions. An outline of their research is as follows. 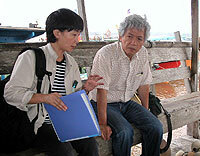 NAGATSU Kazufumi and KATO Tsuyoshi visited Terengganu and Selangor states in December and gave on-site education to KAWANO Motoko and KATO Yuko. At KAWANO's research village and the Fisheries Development Authority of Malaysia in Terengganu, explanations were given from relevant parties regarding small-scale fishing and marine products distribution. In Selangor villagers were interviewed about public health care in the villages and changes in delivery practices and the role of midwives. 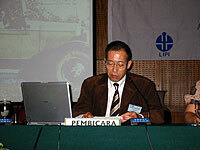 On the basis of these observations and interviews, we advised KAWANO to place her research in the macro political context, incorporating development policies and the local administrative system, and to consider the socio-economic relations in her research site, while KATO was advised to interpret changes in birth practices and social relations from a comparative perspective, focusing not only on rural villages, but contrasting with Malays in new housing estates, called taman. 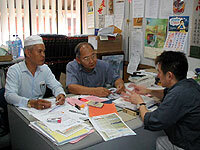 KITANI Kimiya (CSEAS faculty member) and UMEKAWA Michihisa (ASAFAS faculty member) obtained information on the computer environment at Universiti Kebangsaan Malaysia from Dr. Ibrahim Taat of the university's computer center and set up the Bangi FS's environment for using the Internet. At Bangi FS we are in the process of computerizing the following materials. The first has already been completed. The electronic documents will be gradually put on the Bangi FS homepage that will shortly be set up (for university use only) and will at the same time be provided to ATMA's portal site PADAT (Malay World Studies Database). In addition, in FY2004 we plan to computerize items such as Administration of Islamic Law Enactment of different states of Malaysia. And the Bangi FS homepage will be up and running in the near future. NAGATSU, together with SUGISHIMA Takashi (ASAFAS faculty member), held a Field Station Joint International Workshop at the Indonesian Institute of Sciences (LIPI) in Jakarta. In the afternoon session, "Everyday Life and Policing in the Wallacean World," NAGATSU and KAWANO presented their reports, the titles of which are as follows.